The main characters, as always, are Adams' Maxwell Smart and Barbara Feldon's Agent 99. They're aided by Agent Fang, a literal dog the Wikipedia page informs me was a member of Smart's graduating class at the academy. He's not even a particularly intelligent dog, which is appropriate, as Smart isn't a particularly intelligent agent. Side note: I can't help but wonder if Agent Fang was the inspiration for Agent P. Wouldn't surprise me. Maxwell Smart poses (badly) as a customer and makes contact with the agents already placed in the store. Agent 99 is working behind a perfume counter, another agent is posing as a mannequin, there's an agent hiding behind a mirror, and - finally - they've got a man disguised as Santa in the toy department (hence the episode's title). 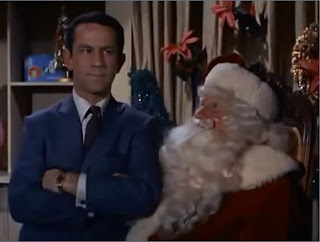 Smart makes contact with Santa by sitting on his lap in a scene that probably wouldn't have worked without Adams' pitch-perfect deadpan delivery. This might have been the best gag in the episode, but then again, I might just be partial. All three of the minor CONTROL agents are taken out by the villains, leaving Agent 99, Fang, and Max hiding in the store after it's closed. Agent 99 has of course already solved the mystery off camera - they're using talking dolls to smuggle information - but they have no way of getting this information to their superiors. They decide to send Fang out with the doll and try to evade the KAOS agents hunting for them. They avoid capture for a while but are eventually cornered in the toy section. Unarmed and outnumbered, things look grim until they grab a number of toy guns and start firing. The villain's actual firepower is no match for the war toys industry, and the heroes are victorious. As I said before, the episode holiday credentials are in dispute. The presence of Santa certainly implies the holiday season, but the lack of follow-up or additional decorations make me wonder whether they really thought it through that far. While there is a plot, it's fairly thin, mostly serving as a thread connecting disjointed skits. I think it's fair to question whether the Santa bit might have been included as a throwaway gag more than a seasonal timestamp. But whether it was the intent or not, it's still there. On top of that, the episode's title is an allusion to Babes in Toyland, which is definitely Christmas-themed. Regardless, I'm recommending this either way. It's a fun, absurd spoof of the spy genre centered around a brilliant comedic actor. I'd have preferred it if they'd left out the canned laughter, of course, but I understand that's the price you pay with old comedies. Even with that flaw, it was a delight to watch.